RAPD markers provide a powerful tool for the investigation of genetic variation in natural and domesticated populations. 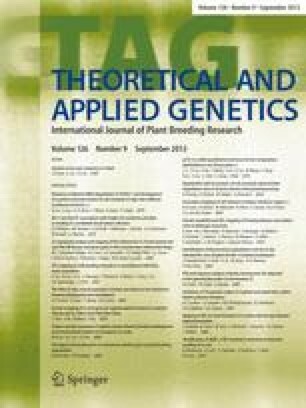 Recent studies of strain/cultivar identification have shown extensive RAPD divergence among, but little variation within, inbred species or cultivars. In contrast, little is known about the pattern and extent of RAPD variation in heterogeneous, outcrossing species. We describe the population genetic variation of RAPD markers in natural, diploid sources of dioecious buffalograss [Buchloë dactyloides (Nutt.) Engelm.]. Buffalograss is native to the semi-arid regions of the Great Plains of North America, where it is important for rangeland forage, soil conservation, and as turfgrass. Most sources of buffalograss germplasm are polyploid; diploid populations are previously known only from semi-arid Central Mexico. This is the first report of diploids from humid Gulf Coastal Texas. These two diploid sources represent divergent adaptive ecotypes. Seven 10-mer primers produced 98 polymorphic banding sites. Based on the presence/ absence of bands, a genetic distance matrix was calculated. The new Analysis of Molecular Variance (AMOVA) technique was used to apportion the variation among individuals within populations, among populations within adaptive regions, and among regions. There was considerable variation within each of the four populations, and every individual was genetically distinct. Even so, genetic divergence was found among local populations. Within-population variation was larger and among-population variation smaller in Mexico than in Texas. The largest observed genetic differences were those between the two regional ecotypes. These patterns of genetic variation were very different from those reported for inbred species and provide important baseline data for cultivar identification and continuing studies of the evolution of polyploid races in this species.